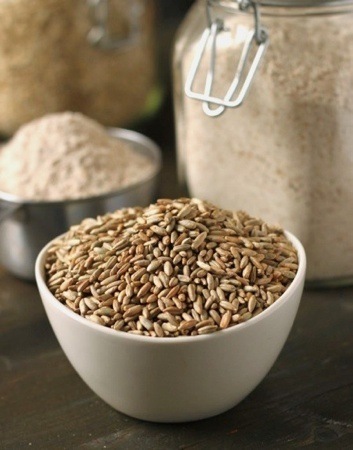 Here you’ll find info about the different types of whole grain and gluten-free flours as well as other not so common ingredients that I use in my baking. And if you live outside of the US, there’s a special section for you! Almost all of my 100% whole grain recipes are developed in a way that you can’t tell that they’re whole grain. There are a few exceptions but I make that clear in the post. What I normally use is whole wheat flour, which you should be able to find in any grocery store. I also like baking with whole spelt, which, to me, tastes less healthy. It has more protein than whole wheat flour does and it’s more tolerable for people with wheat sensitivities. It is not gluten-free, though. More on gluten-free flours later. Bob’s Red Mill 100% whole grain ivory wheat flour (aka white whole wheat) – this has all the fiber and nutrition that regular whole wheat flour has, but it tastes milder and is lighter in color. It’s made from a naturally occurring “albino” wheat, which is the only reason why it’s lighter. It really does have the same nutritional value! If I were starting off with whole wheat baking, I’d start with this flour. Bob’s Red Mill whole wheat pastry flour – this is made from a softer type of wheat that has less protein and less gluten. It’s more finely ground and great for cakes and pastries. For a primer on whole grain baking, please have a look at my whole grain baking tips on GoodLifeEats. There’s a wide variety of gluten-free flours but many of them are either not that easy to find or quite expensive to bake with. 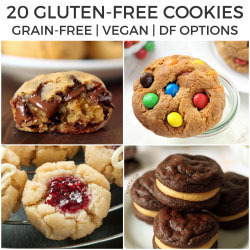 Although I do quite a bit of gluten-free baking, I really only use nut flours, coconut flour, buckwheat, and oat flour (which is just ground up oats). I do this because I don’t usually like the baked goods that all those hard to find flours produce. I also don’t want to start posting recipes that people don’t actually have ingredients for. If you want some more info on those other types of gluten-free flours, here’s an awesome beginner’s guide to gluten-free flours. One important thing to note is that gluten-free flours are often not interchangeable! I’ve seen commenters complain on other blogs that their muffins, which called for 1/4 cup of coconut flour, didn’t come out when they subbed in regular flour. It just doesn’t work. Most of the time in my gluten-free baking, I use almond flour. I don’t even like almonds but I love almond flour! Almond flour is made of blanched almonds and then ground really finely. Almond meal is usually not as finely ground as almond flour and usually, at least in my experience, is not blanched. If you make a recipe that calls for flour and you decide to use meal, it might work, but it’ll have the itty bitty pieces of almond skin in there. For some things where the texture doesn’t matter, that might be okay, but it’s really best to follow the recipe. Buckwheat isn’t related to wheat and actually isn’t even a grain, but a seed that’s finely ground like flour. It’s often referred to as a pseudograin or pseudocereal. Because the full seed is ground and nothing is sifted out, it’s considered a whole grain. It seems as though a lot of people are very confused about buckwheat, so if you still have questions, please read the Whole Grain Council’s post on buckwheat. Coconut flour is an interesting flour. It soaks up a ton of liquid so you often see it called for in small amounts. It is possible to bake something with coconut flour as the only flour, but I personally don’t like the texture. I love mixing it with almond flour, though. I often use mostly almond flour plus a tablespoon or two of coconut flour. And it’s worth noting again – you can not sub coconut flour with other types of flour! Not a clear and straight substitution, anyway. 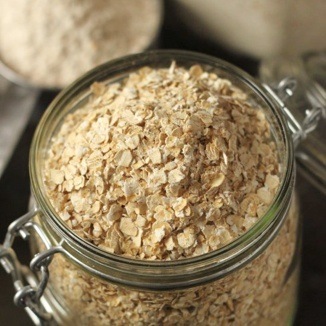 I just use un-contaminated oats and grind them in the coffee grinder until flour consistency. You can also do this in a food processor. If you want to be lazy, get it from Amazon: Bob’s Red Mill Gluten Free Oat Flour – 4 22-ounce bags. I normally use refined coconut oil, which doesn’t have any coconut taste. If you don’t mind some coconut flavor, the unrefined kind is great! Store-bought coconut butter is extremely expensive, so I use homemade coconut butter. It is easy to make, try for yourself! When I moved here back in 2009, it took me a good while to track down all the baking ingredients I was used to from back home in the US. I hope to save you at least some of that pain! I get Suntree Kalifornische Mandelkerne Gemahlen. They come in little 100 gram bags and cost 1.29 EUR at Kaufland. I’ve seen this brand elsewhere. Make sure you get the blanched almond flour and not almond meal (which has the skin). Do not buy Mandelmehl (which translates to almond flour). This is a different type of flour and any US recipe you find calling for almond flour refers to blanched ground almonds. American baking powder is double-acting and German (and I believe all baking powder around the world except for North America) is single-acting. This sometimes creates a problem. If you can, try getting some of the American stuff from visitors or whenever you visit the US. Baking soda is called Kaisernatron over here. I’ve found small green bags of it in the baking aisle at normal grocery stores and also in random sections at the drugstores Rossmann and DM. They also sometimes have Arm & Hammer at Asian shops but be sure to shake the box. Most of the times, they’re rocky and I don’t know about you, but I’d rather not buy chunky baking soda. Also try looking on Amazon for buckets of food-grade baking soda in 1 kg or 5 kg buckets! It is not Brauner Zucker, Rohrzucker, or anything else you can find in a German supermarket. You can only find it at Asian shops or make your own by mixing 1 cup granulated sugar with 1 tablespoon molasses. Forget the things that are called chocolate chips here. They’re expensive and in my experience, they don’t taste very good. I get Zartbitter blocks from Netto and the other discounters that are 3.50 or 4.00/kg and they’re great. Once baked, I really can’t tell the difference between those and more expensive chocolate. Available in Alnatura or any other Bio shop (although maybe only the larger shops?). I get the brand Morgenland. It’s now easily found on Amazon. I get mine from Metro and it’s about half the price of what you find in the Bio shops. It’s REALLY expensive there. Like 25 EUR/kg. It’s now also easily found on Amazon. I get the cheap stuff from the discounters and nobody can tell the difference between this and Philadelphia. It’s .89 EUR/300 grams. The problem is that German (and I believe this applies to all areas outside of North America) cream cheese has a lot of extra whey. For some recipes, like icing, you most definitely have to drain it. I’ll note this in the recipes. Normally, it’s best to get almost double the amount the recipe calls for and drain that in a cheesecloth or a thin kitchen towel which won’t leave behind a bunch of fibers. All-purpose flour is called Weizenmehl Type 550. Ever wonder why your cookies spread totally flat and are super greasy? The standard flour you find everywhere, Type 405, is like American pastry flour. That’s fine for cakes and brownies, but for cookies, bread and crusts, it becomes an issue. For cookies, I normally do half Type 550 and half Type 405. If I post a recipe with white flour (which is very rarely!) I’ll tell you which German type to use. Look for Type 812 flour. It’s not easy to find but you can make your own by adding 1 tablespoon of vital wheat gluten to every cup of Type 550 flour. I learned this from No Ordinary Homestead. 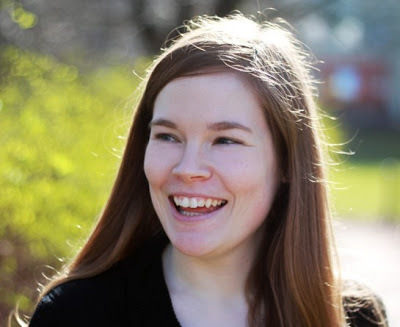 She has lots of other great expat tips for people living in Germany so go check her out! Cake flour is called Kuchenmehl. It’s found almost everywhere except at the discounters. I get the brand Wurzener. I’ve found molasses at the Reformhaus, but it was really expensive. You could substitute the much cheaper and widely available Zuckerrübensirup. The Kaiser’s supermarket near my house now carries Biscoff spread! At the moment, it’s in a display near the fruit section, but I expect that they’ll eventually move it next to the peanut butter and other spreads. It’s 2.99 EUR. And they have crunchy! If you don’t live near a Kaiser’s, you can find it online: Speculoospasta from Amazon. In case they are out at the moment, you can get it here. Make your own! There’s no way around it. I’ll get to this issue later, but for now, you can visit the amazing Healthy Foodie for a tutorial. It’s really easy. Go do that now because i†t’ll take a long time for it to be ready! Look for Weizengluten in bio shops and reform houses. And there’s always Amazon if you want a lot of it! If you have questions about other ingredients, contact me and I’ll add them! 61 comments on “Ingredients” — Add one! Hi! I would like to know whether can I make my own almond flour at home, by soaking them, remove the skin, dehydrate them and blend the almonds in order to have the texture of the flour? Been baking in Germany for quite some time after moving here from Canada and I was wondering why my cream cheese frosting was off. I asked where you get almond flour on your mini cheesecake recipe page, but found this right after so now my question is answered :) thanks! You’re welcome! I’m happy you found it useful. This info is super old and needs to be updated so don’t be surprised if the price is double what I have listed. The price of almonds has gone way up! Coconut flour becomes cheaper to get if you make your own coconut milk. After you filter the pulp from the milk, you dry it for like a day and then blitz it to a fine powder. I currently actually have more coconut flour than I know what to do with. Plus homemade coconut milk is super easy to make and so tasty, and you can decide how creamy/fatty you want or need it to be. This is all dependent on being able to get inexpensive desiccated coconut, however. I’m not sure how easy it is to find over there. Here they sell it in bulk in the health food section of my supermarket for less then $4 a pound, and it’s organic, so I’m lucky there. Sorry I just now saw your comment! Thanks for the tip on how to make coconut flour. :) It’s gotten a lot cheaper in the last few years and much cheaper than when I wrote this page. I think it’s even cheaper than coconut (at least where I am)! So strange. And having more coconut flour than you know what to do with sounds like a nice problem. ;) Thanks again for your tip! Oh my gosh, can’t believe I just found your blog now! I live in Germany (originally from Canada) and I have a lot of trouble with finding the right baking ingredients, particularly flours for paleo recipes. Your equivalencies and where to find ingredients is a godsend! Will be checking out more of your posts later… Thank you! Hi, Tana! I’m happy you found it, too. :) I hope you’ll enjoy the recipes and thanks for stopping by to say hi! I’m almost a Texanerin – I’m an Okie living in Germany, and I’ve always followed your blog. I have one question I thought you might be able to help me with… I have a banana bread recipe that calls for Greek Yogurt, but I was wondering if I could sub quark? Or part quark / part normal yogurt… Thoughts? Hi, Helen! I have to admit that I’ve never used or eaten quark so I’m afraid I’m no help. Do you not want to use Greek yogurt? Or you can’t find it? If you haven’t looked the past few years, we finally have Greek yogurt in Germany! It took a while but it’s here now. :) And I’m serious with the not having looked for the past few years thing. When I first came here, I looked EVERYWHERE for molasses. For months. Couldn’t find it. Then I stopped looking and recently found it at Alnatura. Just too bad that it’s a small fortune. Sorry I couldn’t be more of a help! So excited to find your website! I am a Texanerin living in Switzerland, and finding equivalent ingredients here can be a challenge, so love your German ingredients page! Looking forward to trying the apple cinnamon muffin recipe this weekend! I’m so happy you found the blog! Baking over here can be so frustrating, right?! And do you have flour issues over there? Or is that just over here? I hope the ingredients page will be a help. :) Thanks so much for saying hi and I hope you’ll enjoy the muffins! I’m getting intrigued with the idea of using oat flour … I had never considered using that in place of wheat flour before. Have you made bread using only oat flour? or a combination of spelt along with the oat flour? I’d like to try it, but am hesitant. Oh my, gotta try that oatmeal apple bread!!! It looks out of this world! I guess that I, too, will need to start experimenting a bit more and see what I can do with oat flour — sounds like a really good thing to start using more of. Did you know coconut oil and butter are actually the same thing? Only difference is the temperature. From what I’ve read and experienced, coconut butter is just the pureed meat of the coconut. It contains some oil in it, but also the full meat of the coconut. Coconut oil is just the oil from the coconut meat. I have a jar of Artisana coconut butter in my pantry right now and it’s definitely not the same as coconut oil. :) Coconut oil = just the fat and coconut butter = pureed meat of the coconut. Thanks for this info on finding ingredients in Germany! We just got stationed here about 2 months ago and I thought I would have to make my own almond flour, its good to know I can get it at Kauflands! I’m an American living in Germany too (I’m studying here as an exchange student), and I was wondering if there is a German equivalent for white whole wheat flour? I’ve been having trouble finding it. Good question! I looked a few years ago, found nothing, but decided to search again. One says that it’s Type 1050 and another says Type 1700. But I don’t understand. True whole grain flours shouldn’t get a number. That’s why you see Weizen/Dinkel/Roggenvollkornmehl and not Weizenvollkornmehl 600 or something. When you see Roggen 600 (made up that number), it’s because it’s not whole grain. Any update on this one? I’ve been wanting this too- whole grain wheat flour just always has that bitter after-taste! Really great information. I don’t do much baking, but I really like knowing about various ingredients, in case I run across recipes using unusual ones. I would also like to say that I have taken to using whole wheat flour for a lot of things, which end up having better flavor than with white flour – the best example of that is the tortillas I make with a combo of whole wheat and mesquite flours. Where whole wheat doesn’t work well for me is in things like pasta. Hi Susan! Thanks for all your comments today. It looks like you did a lot of reading. :) I’m so happy to hear that enjoy whole wheat flour in some things. It’s kind of funny what you say about tortillas. Those are one of the few things that I love with white flour! And mesquite flour… that’s adventurous! I’ve never even see that. And whole wheat pasta can be a hard one but I don’t really notice it when I use a nice, heart sauce. But lighter, creamy sauces? Not so good! I usually do not have too much trouble making all American recipes here in Germany. Sometimes a little improvisation is needed, but it seems to always come out yummy! :-) Sadly, we have had a few snow stoms and not enough sun for my liking. I am currently living in Köln, so luckily the snow does not last for too long here. Have a wonderful weekend! I hope you get some nice sunny weather too wherever you are! Oh thank you! I just googled "difference between Philly in America and Europe" and found you. I live in Geneva, Switzerland I've had great difficulties with cream cheese icing setting up. I haven't made it in years, but think it would be best for a spice cake I want to make. I will definitely try draining it before use it. Thanks so much! Glad to have helped! :) To make it like the American stuff, get a 300 gram container (the .89 ones at Kaufland and the discounters are fine) and drain it to 225 grams, which is 8 ounces, which is what the American recipes always call for. I hope it'll work for you this time. :) And sorry for the slow reply! I thought you might want to know that I found a link that sells Speculoospasta for much less than Amazon (3.99€ for a 400g jar). I ordered two jars and shipping was 4,90€ for both. I'm not sure if it is less than what it is at Kaufland, though. I don't have a Kaufland nearby. Thanks for the note about flour and cookies – I was so sick of flat and greasy ones, I quit making them. I've never had any issues with German baking powder and American recipes though. Thank you for solving my "why doesn´t my cream cheese frosting turn out ok" mystery! I´ll definitely drain it nex time. Anon – Hi! I get coconut sugar from a Costco like place in small 200 gram bags. I've also found it at organic stores but it's so expensive there. Unfortunately it's not in "normal" grocery stores but I hope you can find some! Thanks so much for posting this! I have been looking for whole wheat pastry flour on base for ever (I am also a Texan living in Germany). So glad to know there is a cheap alternative on the economy! I look forward to going through all your recipes! Sarah – I forgot to say that my Kaufland now has Speculoos. It's not the Lotus brand, but a copycat version. It's logo is even similar (at least I remember it being similar). I think the Asian stuff has a weird smell too. The chunks are annoying as well! I hope you find the brown sugar. I've used that Thai stuff in a pinch and was frustrated by the texture – plus something smelled horrid about it. Like B.O. horrid. My husband used it and had no issues with it, so it might just be me. By the way, I finally had occasion to make a cheesecake again and I drained the cream cheese for a good 24 hours. I had 1050 g of cheese when I started draining and ended up with 750 g afterwards, so it lost a good amount of whey. Then I used my normal cheesecake recipe and the texture was PERFECT. Dense and creamy, but with a good crumb. Thanks so much for the suggestion! I'm able to find moist light brown sugar at the Asian market. The brand is Tate & Lyle from the U.K. and it works like a champ. My biggest problem when I lived there was I COUDLNT FIND BROWN SUGAR! Nice tip about making it yourself. I bought some in a market and it was NOT American brown sugar, more like raw cane sugar or something haha. Nope, they definitely don't have Biscoff here – I checked. Yet another great reason to go to Belgium. And thanks for the guidance on cream cheese. I can get a fairly rich cheesecake, but I'm having trouble getting it to have that cake-like crumb of U.S. style. I don't normally drain it when making cheesecake, but it would definitely make a richer and more delicious cheesecake. It's hard to say for how long. What I do is let it sit for maybe 20 minutes, and then start wringing it out until it's like American cream cheese. The last time I made something calling for 400 grams of cream cheese, I used about 700 grams to get the 400 grams I needed. It makes a huge difference if you ever make cream cheese frosting. If you use the German stuff the way it is, it'll be soupy. I'm an American living in Germany, too. Thanks for this ingredient clarification page! I always suspected that there was additional whey in the cream cheese, but I use cream cheese so infrequently that I never planned to drain it. This is probably the solution to disappointing cheesecake. How long do drain it for? I got here due to the Biscoff pie, as I'm a sucker for Spekalatius (I'm in Bayern). I've never seen Biscoff anything down here before though. What region are you located in? Maybe we don't have it here.